Welcome Blessing! Please keep posted! I discovered that it blends with the a well-known citrus-scented brand of brilliantine very well. I tried some with a floral-scented brand, and it wasn't quite as successful. The citrus-scented brilliantine comes in spray bottle form and it complements the CoS' fruitiness. I added a few drops and have been using that as my daily haircare thing. Can Crown Of Success oil and products be used for gambling and love purposes? Crown of Success is for school and career success. If you need an all-purpose oil, try Special Oil 20. Oh, so Crown of Success are suitable for students and those at work. Thanks for enlightening, Mama Micki. I should get one for my children soon. Thank you. Crown Of Success, I have found, works very well! Let us know how it worked for you and your children! Good luck! How does Crown Of Success actually works? Do they make the children more obedient in school and at home? or is it mainly to help them score better in their examinations? Pardon me for speaking bad about my children but I'm always feeling as if they're more like monsters than children..always yelling and screaming at me as if they're the boss! Demanding all the pricey stuffs and costly food and never treasuring what have been given to them..
Crown of Success works at making someone successful at what they are attempting to do, whether that be a performance, a test, having a interview, etc. It doesn't make them behave - although if they are trying very hard to behave it will help them be successful at those efforts. If you are having severe problems with your children have you had them in counselling, as well as having them tested for various food and substance allergies and intolerances? Magic won't just instantly turn behavior problem children into model kids - you have to work the mundane efforts too. I would work a Peaceful Home honey jar for you and your children to keep nice, calm, cooperative energies on everyone. Then petition Blessed Dr. Jose Gregorio Hernandez to help you find appropriate treatment or therapy for their behavior issues. It is to make you successful! It can be in school or performing on stage or on your job. Maybe you can combine it with Tranquillity on your children, to calm them down. But also you can work with Commanding products on yourself, so that you will strengthen your leadership abilities, and make them follow your direction. hmm...great ideas given here..my children have had their fair share of counseling sessions and the counselor said they're just in their "children cloud 9 mode" most of the time..so nothing much of what I say to them make any sensible sense to them (because they're not actually hearing me in the heart)..brought them to the doc, and the doc merely said to control their sugar intake to keep down their energy level..which I did..and the kids usually hated me for controlling where it comes to sweet stuffs but I realize that they're actually taking lesser sweet stuffs compared to other kids I'm seeing..but thanks for the wonderful tips, Devi Spring and svarthyndan. I'll try with Crown Of Success Oil and Tranquility Oil for a start. I'm not sure how the honey jars work but the honey certainly looks delicious to me..
well, I've just gone through the honey jar information and found it's not too difficult to follow about the steps of doing it. Maybe I'll consider getting one when I've saved enough..Thanks, Devi Spring. By the way, will the commanding oils make the children uncomfortable? If so, I wouldn't be thinking about using it on them.. hmm..but on second thoughts, maybe I should think of using it on their father instead..it wasn't the first time he'd hit me and the last hit sent me running away leaving the kids with the in-laws (I know it's irresponsible but I wasn't given much of any choice at that time too..had a bleeding head and a swollen right eye..doesn't sound too good to be telling the children why their daddy hit me like that.. ) maybe hoping that commanding products can help me to command him to listen to me so that I won't suffer another hit..
you state in the petition what you want. "I want my children to do as I say and respect my rules"
But Now you share that your husband is abusing you. And then the kids behaviour can be seen in another perspective. It is not uncommon for children who see there mother being abused by there father to behave like this. It is a trauma to the children as well as you and also since there father doesn't respect you they get the false impression that there mother should not be respected. This is serious abuse and none should have to endure it, ever. I was going to link to an organisation in your country but I will PM you that instead since I don't know if that is allowed on the forum. I hope you can get in contact with them to get some support,and hopefully you will be able to have life free of violence and fear. I don't know the laws in your country but it probably serve you well to document the abuse with photos and to write down every time something happens. You might need it in the future. I am so sorry to hear your situation and I want you to know you deserve much better. If you do want help with your situation you might consider asking a professional root-worker for guidance and spiritual coaching. Thanks ida..had gotten your PM and had replied you as well. I've nothing much to fear except for the wellness of the children, that is. It was I who had given birth to them so it is also part of my responsibilities to make sure they're doing good. I do agree about the trauma that's indirectly impacted on them while things go wrong but I'll keep your advice in mind should something happens again. Maybe I'll seek help from the rootworkers of LM when I've saved enough. I'd only wished it had never happened before but the scars left in the mind's not erasable though..I'll never forget how I couldn't walk for 2 full months and had to undergo a series of acupuncture sessions..*ouch* I haven't really check out how much the rootworkers charge..I'll check out soon and maybe save a little here and there till I'm fit to get help from them..
Just a little update from me regarding this oil..I've asked permission to bring home some of this oil and Tranquility Oil as well..and I've mixed up both this oils that I've gotten(not much..but enough to last for 3 days' time). I added a few drops of it on the kids' bath water in the evenings and applied on their head when they wake in the mornings and had noticed some changes going on with them..they don't actually hit each other that hard anymore and they could doodle on the same book without pulling hairs and offering punches to one another (which usually causes much screaming and shrieking all the time if they do that..) Though the effects aren't very strong but I noticed too that they are willing to try to listen better when I'm talking to them and I did see that they are trying very hard to behave as best as they could too. Thanking all who've helped to advice on the probable usage of this oil..especially Ida who'd been very kind to help guide me along all the while. Thanks! I'm just glad I could provide some guidance that helped you. And happy to hear the products are working for you. Hi! I would like to know, can I dress a purple candle with COS to get someone to accept an application or should I stick to yellow? Thanks! Not 100% certain, but I think in that case it would probably be personal preference. Is it a job application, credit application, or another type? That might determine the color more. The application is for Aid to Families with Dependent Children. I was laid off a few weeks ago and someone told me that this program will help me until I find another job. Yellow is associated with the sun and wealth and purple is associated with power and commanding. I'd recommend a green candle dressed with Money Drawing or Wealthy Way and Influence, Compelling, or Commanding oils. Crown of Success is for career or school success, so it is used to dress resumes and college applications. You could also try a honey jar to get the AFDC worker to approve your application. Again, just my personal input, but to me yellow also represents the sun, etc. But it's also the color of happiness and security. Purple is a regal color (Roman royalty favored this color) and a color of someone in 'power'......I could see both angles....you want your family to be happy and secure while looking for another job, but you also want to have the upper hand with AFDC in order to get the benefits you need. I guess it would depend on how you feel you need to approach the situation. I'd also take Mama Micki's advice about the green candle with some sort of wealth/money drawing oil, and after you get another job, dressing a green candle with steady work once a week. You can always take more than one approach simultaneously, of course. My personal choice here would probably be to use a green candle, as Mama Micki has suggested, dressed with Steady Work and Fast Luck oil. But you may also want to do a honey jar on the person who will be making the hiring decisions, and on that I would burn purple candles dressed with Compelling oil, Do As I Say oil, or the like. You could also burn an orange candle dressed with Road Opener while you do all the other work, which I think would round the whole thing out rather nicely. Thank you for the replies. I will try the green candle dressed with Money Drawing & Influence oil. What color candle could I use for the Influence oil? If you're trying to influence a person to do what you want, purple would probably be best in this case. I'm a cabaret dancer and have a new venue & audience coming up. I've some nerves regarding the situation and want to make the audience receptive and pull of a good show. I'm aware it is better to blend oils in odd numbers and one of the oils i've ordered is Crown of Success, to achieve recognition on stage, which instructs to apply to the bridge of the nose over the brows and forehead but i sweat when i dance and it can get in my eyes thus with the addition of an oil, the outcome wouldn't be desirable. Are there any other ways of applying this oil with a mixture of other oils as I'm also thinking of adding Crucible of Courage to increase personal determination and Bewitching oil to add fascination and allure - so all in all to increase personal magneticim, self assurance, and enchant the audience if you will. I was also thinking of adding Van Van oil and John the Conqueror for similar reasons, what would the consensus on this combo and application be, I was otherwise thinking of applying it as an anointing oil to the body with one of the perscribed mixing oils thats advised to use as if a massaging oil ? Making talismans or mojo bags would be difficult as the costume doesn't leave room to hide things really, the other option perhaps would be a bath before hand but for some reason i'm drawn to oils i can apply to my body and wear while giving the performance. I've read through the advised pages so i hope i haven't missed anything and made unnecessary inquiries but this is also my first Hoodoo application so would feel alittle securer if anyone has words of advice. Crown of Success (http://www.luckymojo.com/crownofsuccess.html) can be applied to the crown of the head. Crucible of Courage (http://www.luckymojo.com/products-cruci ... urage.html) can be applied to the crown of the head. Look Me Over (http://www.luckymojo.com/lookmeover.html) can be worn as you would your perfume, again read how to use anointing and dressing oils. I would use the Bath Crystals as well for an additionally feeling of empowerment. Consider ordering the Vigil candles to increase the odds even more. You can always add the oils to some unscented body lotion and then dress your body with them that way. And yes, you can put a dab on the crown of your head within your hair, which shouldn't cause a problem with sweating. I love the information and the recommendations about the kids. While i don't have any of my own I teach middle school, mainly boys and was thinking of what would be the best direction to take regarding getting them to be more respectful to me and to following directions, and doing what I ask of them in class without mumbling, wasting time, etc. I'm going to definitely get me some of the commanding products. Just need to figure out the best way to use these in my classes with my students. I ordered CoS oil for my mojo, but I've been using it to anoint my head, business cards, computer, etc. I've definitely seen some results so far. I definitely love the smell...for some reason it's comforting to me, but energizing at the same time! I'll have to keep it in my arsenal. Comforting and Energizing...YES! I agree...it gives you the Calm Energy to go get that Success! Glad you like the Oil, it's one of my favorites as well. I just got Crown of Success, and I find that it really helps with not only concentrating and focusing your intellectual power toward studying, thinking, etc., it also really makes up the difference in guesswork, too! I did an online quiz today, and for every question that I had NO clue how to answer, I was drawn to a specific response and it was correct every time. It happened over and over. Now hopefully with COS helping me study, I won't need to rely on its guesswork powers. Oh, I should say I anointed my head and fingers with the oil before taking the test. That's great! I would use this in addition to king solomon wisdom as well. Both are great products for tests. Just chiming in to agree this oil smells wonderful. 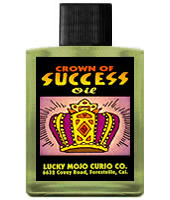 Crown of Success Oil rocks!! I can't say enough good things about this stuff! At another event involving the press, I did really well, and came out on a state-wide news source besides the local news. I am so happy with this My new boss called to tell me what a good job I did. Thank you so much for making such amazing products, Lucky Mojo! I also just got a test back that I thought I flunked pretty severely, but no---90! Thank you for sharing your story. It is always an inspiration to hear about the good experiences people have with the products and hoodoo spells. I had to second this. I have been anointing my crown every morning with Crown of Success. People look at you differently (in a good way). My former boss is currently a director at my new company. I felt silly reaching out to him when I realized this months ago, because he was never very nice in the past. I got the guts up to drop him an e-mail a few days ago, and I was met with a favorable response a few days ago. He was in London winding things up at the end of his day and took 10 minutes out of his day to talk to me. I can't say enough good things about your beautiful oils. Thank you Lucky Mojo team! I have a question about dressing your head. If you wear a wig or hair extensions, do you have to make sure the oil gets to your natural hair? I put a little on my forehead and on my scalp (right in the middle). If you have a weave or extensions, I would try to get in between the tracks to your scalp. Our household is never without at least 2 bottles of Crown of Success Oil. We use it for so many different workings. Another great LM product. I use this for school (along with the mojo bag which I always carry on test days). I still have to study but COS has helped me tremendously with my grades in some very difficult classes. I also recommend the COS vigil light. COS coupled with King Soloman is a great combination!! Crown of Success Oil has made a significant difference in my life. I have been working with this oil on tea lights, in a diffuser and in shared family hair products. My children are improving in their school work and with doing chores. I'm noticing a much stronger focus and ability to get things done at my job. I love everything about Crown of Success and the results I'm getting! That is great to hear LaDonna. Thank you for sharing that and informing other people on here. The Crown of Success does usher in that slow and steady success! Best of luck to you for ongoing success! Please remember your manners goldentouch97. I also went ahead and moved your post because it had more to do with Question and Answers then a Testimonial for Crown of Success. Anyways, where would you put a crown? Read through How to Use Conjure Oils, Hoodoo Oils, Ritual Oils, Dressing Oils, and Anointing Oils from Hoodoo in Theory and Practice to help give you additional ways to work with this wonderful condition oil. There is not place on the body where you "must" put Crown of Success Oil -- you can use it on your feet if you are a runner or on your hands if you are a musician -- but, as Papa Newt said, it is most common to put it on your hair and head, because the top of the head is called the crown of the head and a woman's pretty hair is said to be her "crowning glory." Thanks a lots catherineyronwode,i received it this morning,beautiful smell,i gonna try it very very soon,thanks a lots for yur book " hoodoo herb and root magic " also. Wash your clothes with Crown of Success Bath Salts. This includes everyone in the family. This is my first week with this oil,and i'm very happy with the result,i follow a degree course since 1 month and have some tests everydays,since i start to use this oil trust me it's the first time i have good appreciations like that with all my teachers.This oil is amazing trust me.I put it on my hair and my head every morning after my shower when i left my house.But i noticed that in the end of the day it have less effect pon me.Does it mean i need to bring my bottle of oil with me and re put a little on my head during the day.Let me know please. My adopted daughter, Amanda, being extremely empathic, has been having a really hard time, having found out someone with whom she had become acquainted lost her unborn child. Having gone through five miscarriages of her own, before finally bringing my grandson onto this plane nearly 11 months ago, she knows far too well this pain and suffering. I used the Crown of Success, which really does have a wonderful scent, allowing for its work to begin in my humble opinion on opening the bottle, to dress a candle for her success in being able to circle her grief and empathy for this female back into positive healing energy for herself, the female and her family with the intent that she not deplete her own inner resources. I haven't gotten to speak with her yet, as I travel during the week for work, but I will try and get an update this weekend as to how she's feeling and whether or she's been able to ground and center herself again. I know it probably sounds like a scratched record, but I say again what a blessing it is to have such invaluable resources, such as those found here on the forum and at LuckyMojo.com and all the extended links from there. Gods bless abundance in like-kind to all those who give so much of themselves through the services they provide to their clients and this community. As for my daughter, if anyone has other suggestions, I am totally open to them. I am not new to Craft, but I am new to Traditional Hoodoo rootwork and conjure, and I want nothing but to learn and to learn the right way, hence, it's why Spirit has brought me here, again, only this time I get it. I'm tellin' you, I'm REALLY enjoying these products!! WOW!! Thanks for the testimonial SilverDaniels, CoS is really wonderful. It also acts as a great catalyser when combined with other blends to boost the ''Success'' aspect of things. For issues of the mind and difficult problems, it also combines really well with Clarity and King Solomon Wisdom: in fact, those three oils together make a great 4oz Rootworkers Special for therapists, school children and trouble-shooting of all kind. Working it with money oils and with luck oils can also be great: give it a try and let us know what you think! I will most certainly keep all those combinations in mind. I also have Kiss Me Now and Fast Luck which may work fantastically together if I include Crown of Success. I love experimenting with the different combos. Since, I'm new to Lucky Mojo products, I'm purchasing a few at a time, and "playing" with their effects (and keeping notes!). I've been doing tons of experiments with different Lucky Mojo oils and herbal applications. It's been a real BLAST! My goal is to have a hands-on understanding of how the different products work, and behave so I'll know exactly how to employ them in the future. It's my darn Aquarian mind...I have to turn everything into a freak'n science project....LOL!! With the Warmest of Regards! !